CJayride and a friend (source). Littering is generally not a great idea. It’s an especially bad look if you’re an American Twitch streamer living abroad in Taiwan, where some residents are, at best, skeptical of your portrayal of their country. American Twitch IRL streamer CJayride is paddling his way through a scalding tub of hot water after running afoul of Taiwanese media during his misadventures. 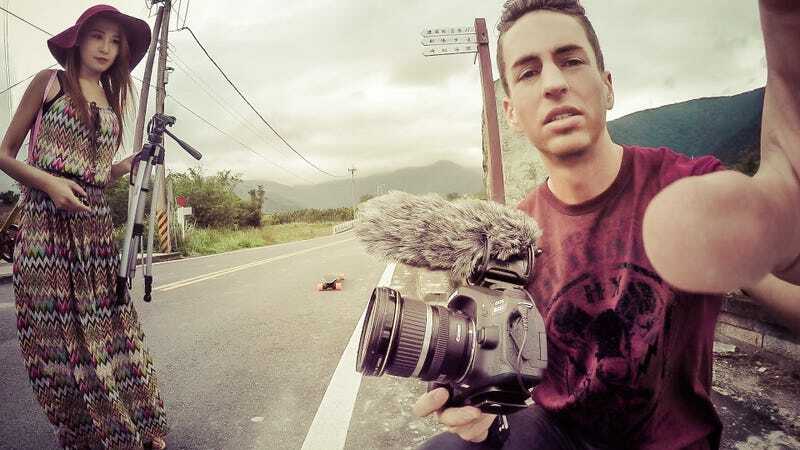 Generally, he livestreams himself exploring Taipei, riding around on an electric skateboard, meeting people, going on dates, flying his drone, and hanging out. Sometimes, things can go too far. For instance: once, he decided to fly his drone near patrolling military helicopters. He’s also ridden his board in ways that skirt the edge of what’s legal, and he’s filmed and commented on people without their permission. For locals, the antics look like an American who is using a foreign culture to entertain a rowdy audience. It doesn’t help that CJayride claims he is “introducing Taiwan culture to the world” through his streams. A video of CJayride flying his drone near patrolling military helicopters (source). The thing he’s been most consistently dinged for, however, is littering. This week, a video depicting multiple occasions on which CJayride has littered (as well as a handful of other infractions) circulated on YouTube and throughout Taiwanese news media. In it, he sticks a bamboo skewer in the ground, flicks fish balls into a bush, and leaves a plastic cup at the entrance to a train station. He also briefly films a couple of women arguing (though he quickly leaves), as well as some people on trains (though mostly as background imagery while he talks about what he’s up to). The video that accused CJayride of littering and other infractions (source). By typical Twitch IRL standards, this might not seem like much, but to some people in Taiwan, what CJayride is doing is considered very disrespectful. In an effort to prove it, Taiwanese viewers have crashed his streams and tried to argue against CJayride’s claims that he is just sharing Taiwanese culture with the world. Showing him one of his own clips, a young man said, “This is not Taiwan culture.” “Thank you,” replied CJayride, clearly uncomfortable. “I love Taiwan!” he added as the young man walked away. On another occasion, CJayride was stopped by newscasters, at which point he claimed to be only visiting (despite that his Twitch page says he lives in Taipei, and he’s said in videos that he’s been there off and on for four years) and said he didn’t understand them, even though he can generally speak the language pretty well. In response to the recent controversy, CJayride began a recent stream with an apology for his littering, saying that it was part of his on-stream “character,” who mostly just talks about littering as “satire” of Taiwan’s public trash disposal infrastructure, which he finds lacking. He also claimed that a Taiwan government agency reported his stream to Twitch, and in light of that, he’s gonna clean up his act. “I apologize for my actions and this will no longer continue,” he said. I reached out to CJayride for more details, but as of writing, he had yet to reply. I also reached out to Twitch, who said they don’t comment on whether or not things have been reported about their community. In response to all of this tension, rumors have started swirling that CJayride was asked to perform 100 hours of community service. We could not find evidence this actually happened, beyond a stream where CJayride claims he is being painted as a “criminal.” In refutation to the supposed defamation, he plans to volunteer at animal shelters and raise funds for charity as part of his stream. “People all around the world will be donating,” he said, “to help maintain this prosperous and great place.” He then went on to lambaste Taiwanese news companies, who he believes slandered him to the point of illegality.